Willowood Sulfentrazone MTZ DF is a broad-spectrum herbicide that when applied as a fall burndown treatment, provides multiple modes of action to control winter annuals and other problem weeds. The residual activity of fall applied Sulfentrazone MTZ DF not only keeps weeds from emerging, but also leaves you the flexibility in the spring to plant soybeans or corn. Applied in the fall or in the spring, Sulfentrazone MTZ DF controls glyphosate and ALS-resistant weeds that otherwise rob yield, moisture and nutrients. 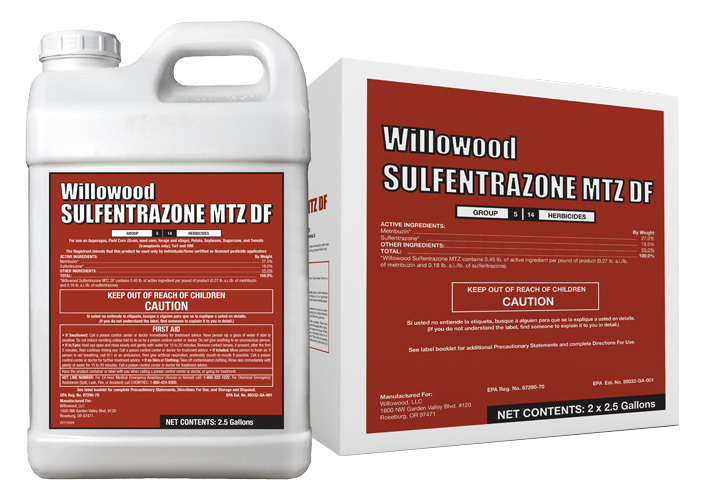 For specific use instructions refer to Willowood Sulfentrazone MTZ DF product label. *Willowood Sulfentrazone MTZ DF contains 0.45 lb. of active ingredient per pound of product (0.27 lb. a.i./lb. of metribuzin and 0.18 lb. a.i./lb. of sulfentrazone). AUTHORITY MTZ® is a registered trademark of FMC Corporation.